the Independence & freedom of their Country. 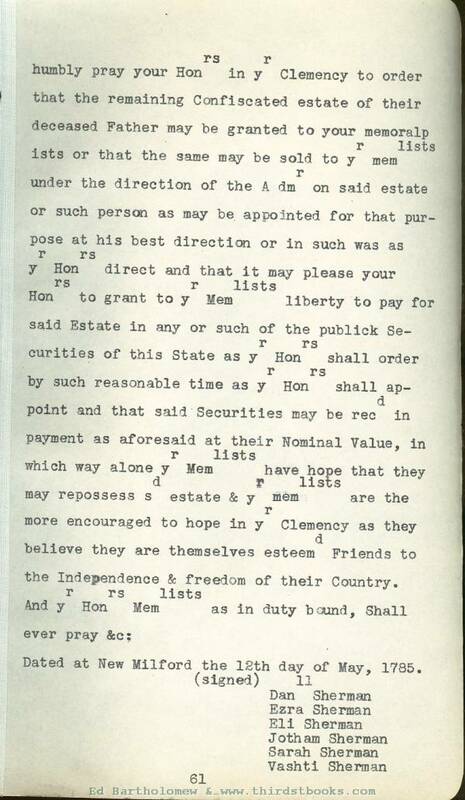 Dated at New Milford the 12th day of May, 1785. Obtaining the prayer of their above memorial. money due & that Bill &c.
Concurr(d) in the Upper House. 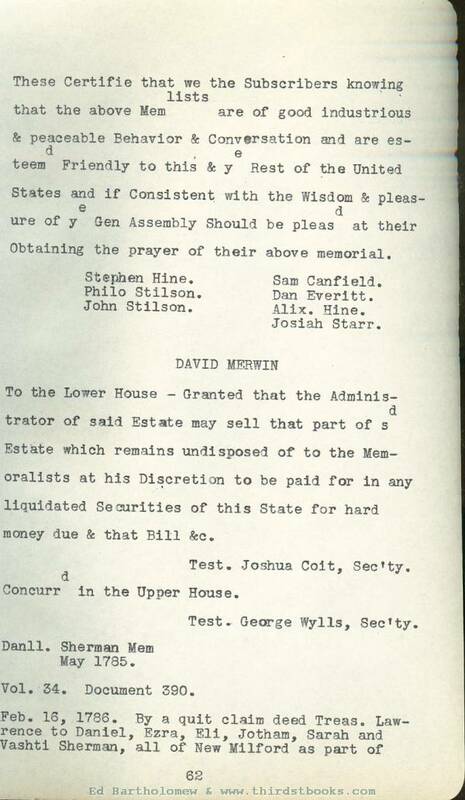 the confiscated estate of Justin Sherman, L 300. By balance for which account of John Chandler Esq.s to have credit in Acct. with the State -£-556. 6.0. Errors excepted. Feb. 16, 1786. Both the Sherman and Botsford families were early communicants and staunch adherents of the Episcopal Church in Newtown. Most Episcopalians were Loyalists though it took courage to stand for their convictions in the face of Indignities offered them by previously kind neighbors and friends. Susannah (Botsford) Northrop, sister of Hepsibah, Justin Sherman’s wife, supported her family during the Revolutionary War by weaving on a loon and her sons served in the American Army but her neighbors disrespectfully called her "the old Tory." Betsy, Justin oldest daughter, apparently shared his Loyalist convictions as her name does not appear in the petition for the return of his estate and the family record says that she and her sister Vashti died on their way to Nova Scotia where many Loyalists, after the Revolutionary War, received grants of land and lots in the city of St. John. 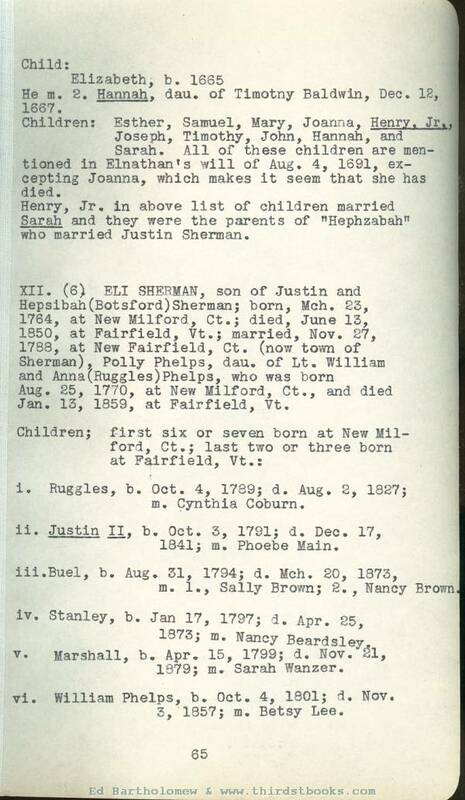 The marriage record of Justin Sherman and Hepsibah Botsford has not been found, probably because the early records of Trinity Church, Newtown, were lost. The Rev. John Beach was Rector of that church for fifty years and died before the close of the Revolutionary War. Some years ago the church records were lent to a relative who desired to write the life of Mr. Beach; this relative, unfortunately lost the bag containing the records off a boat on which he was travelling. Justin and Hepsibah Sherman moved from Newtown to New Milford, Ct. soon after their marriage; at least they were residents there in 1760 when Daniel their oldest son was born, as he states in the petition for the return of Justin’s estate that he is a native of New Milford. The names of Daniel Sherman and Eli Sherman appear as heads of families in New Milford in the census of 1790. In the spring of 1795 Daniel and his family moved to Vermont and settled at Hinesburgh. Eli Sherman, younger brother, followed sometime between 1800 and 1807 and settled at Fairfield, Vt. The two other sons of Justin and Hepsibah, Ezra and Jotham, and daughter Sarah, lived and died in New Milford. i. Elnathan, bapt. Aug. 1641; m. Hannah Baldwin. ii. Elizabeth and Mary, probably twins, bapt. May 21, 1643. Elizabeth m, June 27, 1665, Dan’l Baldwin. Mary m, Jan. 8, 1668, Andrew Sanford. iii. Hannah, bapt. Dec., 1645, m. Mch. 12, 1671, Nathaniel Baldwin. 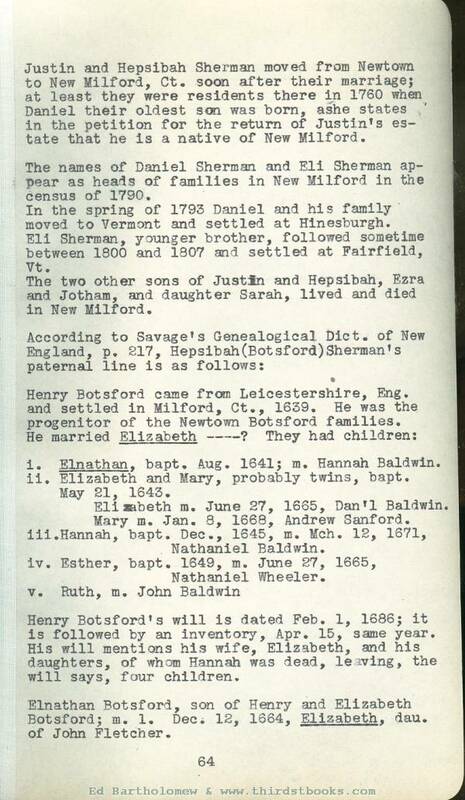 Henry Botsford’s will is dated Feb. 1, 1686; it is followed by an inventory, Apr. 15, same year. His will mentions his wife, Elizabeth, and his daughters, of whom Hannah was dead, leaving, the will says, four children. Elnathan Botsford, son of Henry and Elizabeth Botsford; m. 1. Dec. 12, 1664, Elizabeth, dau. of John Fletcher. He m. 2. Hannah, dau. of Timotny Baldwin, Dec. 12, 1667. Children: Esther, Samuel, Mary, Joanna, Henry Jr., Joseph, Timothy, John, Hannah, and Sarah. All of these children are mentioned in Elnathan's will of Aug. 4, 1691, excepting Joanna, which makes it seem that she has died. Henry, Jr. in above list of children married Sarah and they were the parents of "Hephzabah" who married Justin Sherman. XII. 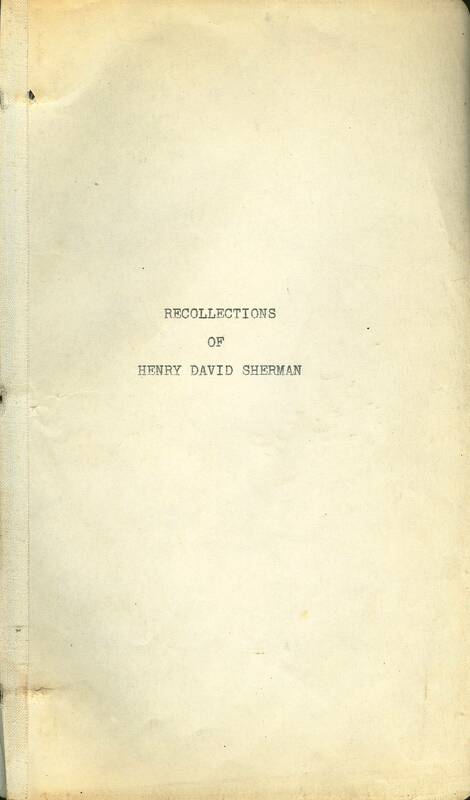 (6) ELI SHERMAN, son of Justin and Hepsibah(Botsford)Sherman; born, Mch. 23, 1764, at New Milford, Ct.; died, June 13, 1850, at Fairfield, Vt.; married, Nov. 27, 1788, at New Fairfield, Ct. (now town of Sherman), Polly Phelps, dau. of Lt. William and Anna(Ruggles)Phelps, who was born Aug. 25, 1770, at New Milford, Ct., and died Jan. 13, 1859, at Fairfield, Vt.
i. Ruggles, b. Oct. 4, 1789; d. Aug. 8, 1827; m. Cynthia Coburn. ii. Justin II., b. Oct. 3, 1791; d. Dec. 17, 1841; m. Phoebe Main. iii. Buel, b. Aug. 31, 1794; d. Mch. 20, 1873, m. 1., Sally Brown; 2. Nancy Brown. iv. Stanley, b. Jan 17, 1797; d. Apr. 25, 1873; m. Nancy Beardslev. v. Marshall, b. Apr, 15, 1799; d. Nov. 3, 1879; m. Sarah Wanzer. vi. William Phelps, b. Oct. 4, 1801; d. Nov. 5, 1857; m. Betsy Lee.